From hotel to convenience store to restaurant, whatever type of operation you run, Red Diamond® has the equipment and expertise to help ensure that when you serve Red Diamond Coffee and Tea, your customers enjoy the perfect beverage experience. Consistency is one of the keys to quality. And of profits. At Red Diamond, part of consistency is ensuring a perfect product every time. With our FitzTM Cold Brew, preparation is simple, but critical to how it’s enjoyed. That’s why we’ve provided you with a quick how-to video with step-by-step instructions to master the art of cold brew. 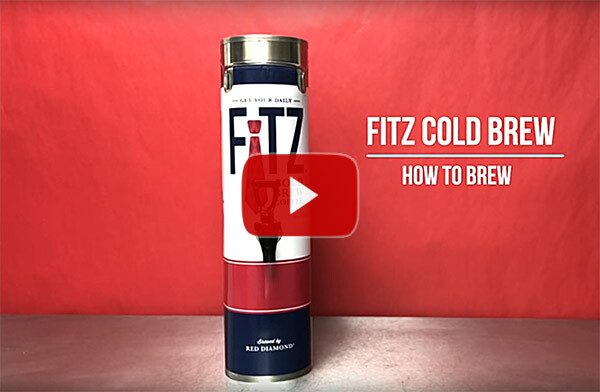 Take advantage of the growing demand for Fitz Cold Brew from Red Diamond. After watching the video, you can learn more about the product here. Red Diamond continually perfects our process by coupling excellent products with top-level support to restaurants, hotels, offices, convenience stores, healthcare facilities and other purveyors of food and beverages. We install, maintain and service a variety of equipment that’s fine-tuned to deliver the great tastes built into our coffee and tea products. We want our service to improve your bottom line. Properly installed and serviced equipment yields a consistent customer experience from visit to visit. Our customers tell us that consistency and quality are keys to profitability and are why they continually turn to Red Diamond for their Coffee and Tea Service needs.